Corn development is related to soil temperature. 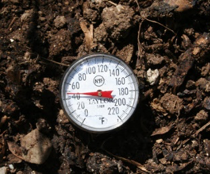 Good germination and emergence are likely when the soil temperature is a minimum of 50 degrees at a 2-inch soil depth. Corn stands may be reduced when the average soil temperature is below 50° F. If planting before optimal soil temperature has been reached or maintained, seeds may remain dormant in the soil, however, when this occurs they become increasingly vulnerable to diseases and insects. Growers should not only consider soil temperature at planting but also the expected temperature when seeds begin rapidly soaking up water. Establishing a good stand can be improved greatly with at least 24 hours of warmer, moist soils for germination to occur before a cold stress incident. Choosing hybrids with higher stress emergence scores can help reduce exposure to stand loss due to cold soil temperature. Selecting a hybrid with higher stress emergence is a good practice to follow so check with your local seed advisor to determine the stress ratings for the hybrids that you will plant this spring. With spring comes field preparation followed by planting so it is important to know your soil moisture level. Knowing how much soil moisture you have helps in minimizing the impact of fieldwork on soil compaction. Adequate soil moisture is also a key to uniform emergence. Most growers know what adequate soil moisture looks and feels like. In essence, adequate soil moisture is probably close to field capacity. Corn needs to absorb (imbibe) soil water to approximately 30% of its weight and the soil temperature needs to be at about 50°F to germinate. 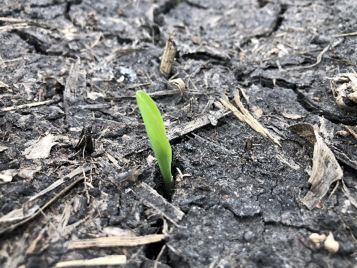 Uneven soil moisture throughout the seed zone is the primary cause of uneven emergence and uneven emergence can easily translate to yield loss. Read more of our Agronomically Speaking content here!